Wow. take a closer look at that picture. do you notice all the tears? 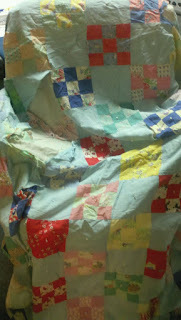 You can photocopy the fabric you need to replace if you have a good piece elsewhere in the quilt and then print it on fabric and it will be hard to tell the difference. Let me know if you need help. candace- i had no idea I could do that! I will definitely need your help! I know enough to be able to sew it all together, but I was really worried about what I was going to do about the squares that were missing pieces.